Over the years there has been great debate about whether graffiti is art or vandalism. Under the law of Florida damage to property, including graffiti, is a felony that can lead to 5 years imprisonment in certain cases. Graffiti is a pain for many property owners. Profane graffiti can result a loss of business and cleaning it up can cost property owners thousands of dollars. Thankfully, new window film technology has made it possible to protect your property from damage caused by graffiti with anti-graffiti window film. Here we discuss how this high-quality window film works, its benefits and where you can have installed. Anti-graffiti film works by shielding your glass. It is a multi-layer film applied to the surface of windows or mirrors and protects them from the various forms of graffiti. The film makes it possible to remove paint and markings with household cleaning products. In cases of etching and scratching, your glass will remain protected and can be returned to its former state by removing the top layer of film. The polyester film is available in different thickness allowing for different degrees of protection. Anti-graffiti film shields your glass and pocket from damage as replacing the layer of film is a lot cheaper than replacing vandalized glass. Many businesses are targets for graffiti, resulting in vandalized store fronts that attract less customers. Protective commercial window tinting can increase security, but only if it is intact and that’s where anti-graffiti window film comes in. The film can act as an additional layer of protection for your existing window film. Anti-graffiti film is a clear film, which means it won’t interfere with the color of your window’s existing tint or reduce visible light. When it comes to graffiti, it is best to act at first sight because it only takes one vandal to inspire many to do the same. If left alone, one drawing or etching can become many as different vandals add their personal touch. Anti-graffiti film makes keeping your glass graffiti free easy as all it takes is a clean or peel to remove. If your home or commercial glass remains graffiti free, vandals could be discouraged to even try to attack your property as doing so will be futile as it will be removed before it receives the attention they hope to get. The multi layered nature of the film can go beyond protection against graffiti. It can also provide protection against the harmful UV rays of the sun. Some films can guarantee up to 99% protection and significant heat reduction, protection your home and business in more ways than one. 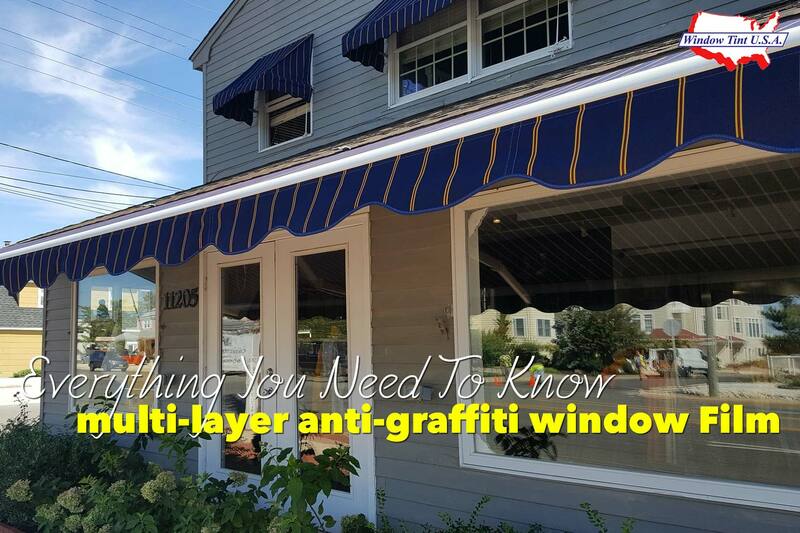 When selecting your anti-graffiti film, be sure to discuss your UV protection needs with the installation company for this added benefit. Incorrectly installed window film can do more harm to your glass, existing tint and budget. This is why it’s important to make use of experienced window film installers. Finding an experienced window film installation company near you can be challenging. Luckily, Window Tint USA, based in Florida can tick all your window film installation boxes. Our professional window film installers are certified to install residential, commercial and automotive film. Contact us today to set up an appointment to install your anti-graffiti window film. Window Tints USA sets the standard for service and professionalism in commercial window film.